2. Which of the following motor will give relatively high starting torque ? 3. 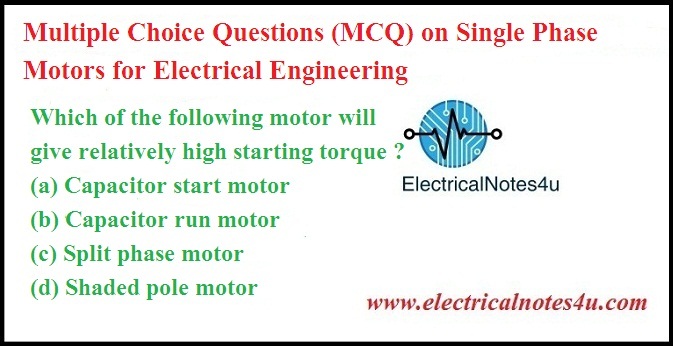 Which of the following motor will have relatively higher power factor ? 5. If a particular application needs high speed and high starting torque, then which of the following motor will be preferred ? 10. Which of the following motors is used in mixies ? 11. Which of the following motors is inherently self starting ? 15. For which of the applications a reluctance motor is preferred ? 17. Which of the following motors is preferred for tape-recorders ? 28. Which of the following applications always have some load whenever switched on ? 30. Speed torque characteristic of a repulsion induction motor is similar to that of a D.C.
33. Which of the following motors is used in a situation where load increases with speed ? 36. Which of the following motors is used in tape-recorders ? 39. Which of the following motors has two separate windings on the motor ? 44. Which of the following statements regarding hysteresis motor is in incorrect ?